There are many reasons why we study; to learn new skills, advance our careers, or to broaden our perspective. For Buol Juuk and Sumbo Ndi, it was the desire to help others. Buol migrated to Australia from South Sudan in 2004. While working as an interpreter, he enrolled in the Certificate IV in Community Services at the Australian Institute of Social Relations (AISR), the training division of Relationships Australia SA. 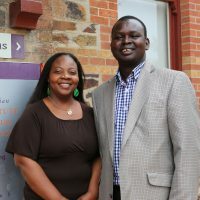 That study led to employment at Relationships Australia SA, where he initially worked in health promotion within the Sudanese community. As the former training manager for a blood borne viruses prevention program at a displaced persons’ camps in South Sudan, becoming a community educator was a natural fit for Buol. Over the next seven years, Buol completed five qualifications with the AISR. He worked full-time during the day as a CALD (Culturally and Linguistically Diverse) Community Liaison Officer and as a Family Dispute Resolution Practitioner, and studied at night after his children had fallen asleep. For Sumbo Ndi, an interest in learning about the social impact of her work in the sciences brought her to study at the AISR. Originally from Nigeria, Sumbo came to Australia in 2003 to pursue a PhD in Biomedical Science. Sumbo is currently studying the Diploma of Counselling at the AISR while working with Relationships Australia SA’s PEACE Multicultural Services Team, coordinating their Blood Borne Viruses program. Relationships Australia SA practitioners contribute to, review and teach AISR courses, bringing with them real-life scenarios and knowledge gained from working in the industry. Sumbo says the practical training and insight grounded in real work contexts has been invaluable to her. For more information about our Nationally Recognised Qualifications, visit our website here.